Fully tested and in good used condition. Includes wall mount bracket. Specs from PDF listed below. High Frequency Contour: ISO2969 Curve X surround contour. (18.0 in x 18.0 in x 10.2 in). Grille Color: Black. 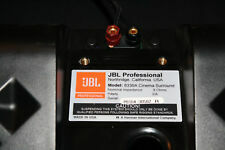 JBL 8340A Pro Cinema Speakers (pair). Sale is for two speakers. Speakers are in very good shape. The 6.5" mid-driver and the high-frequency compression driver are equipped with molded aperture waveguides, which compensates for high-frequency spreading caused by perforated screens for improved audience coverage. The JBL Cinema SB350 soundbar system is well equipped for external device connections, with 3.5mm and digital optical inputs. There's also a USB port available for software updates. As an added convenience, 3.5mm, optical, and HDMI cables are included. 1 x Subwoofer. What's Included. used good , There are some scratches, Covered in front of the torned speaker the corners ,please look carefully at all pictures before buying, On the high floor speakers lost a plastic bar, I was pointing fingers, please look carefully image, All were well presented & Due to the heavy speakers, we do not accept return, We would like to inform you clearly, (FINAL SALE) . For international customers, you must pay all fees incurred if any. Speakers will be packed very carefully, very professional before shipping, sincerely thank you. The 4648A system covers the frequency range from 35 Hz to 500 or 800 Hz, depending upon application. JBL 4648A 4 Ohms Dual 15" Low Frequency Cinema Speaker System. The twoway 8320’s reliability and performance features position it as the ideal low cost, compact surround for the extended dynamic range required by digital sound formats. Convenient mounting design uses JBL QuickMount™, Omnimount® or APC Multimount brackets. High Frequency Contour ISO2969 Curve X surround contour. SMPTE/ISO2969 Curve X high frequency de-emphasis. Internal Thermomaster® technology allows for unprecedented high frequency power in a compact molded enclosure. Hardly used JBL SB400. Excellent condition, Like New. Purchased at Best Buy over the 2016 Holiday Season. All accessories included. No Scratches or dents. Up for sale is a pre-owned (2) JBL 3310 Professional Surround Sound Speakers. This item is in good overall condition, showing signs of normal wear such as so scratches/scuffs on the back/bottom/sides of the speakers, from previous use (see photo). JBL SUB125A Home Theater Subwoofer Black Simply Cinema. Condition is Used. Shipped with USPS Parcel Select Ground. JBL CINEMA SB400 - 120-watt Wireless Bluetooth Soundbar. Condition is Used. Shipped with USPS Parcel Select Ground.